This picture was taken sometime in 1945 (when the trees were not in leaf). See also photographs of Roger Godfrin taken in 1945 and 1953. Foreground: the young Roger Godfrin, aged about 9. Front row, left to right: Armond Senon, Mathieu Borie, Daniel Senon, Clément Broussaudier, Joseph Beaubreuil, Robert Besson, Paul Doutre, Martial Machefer. 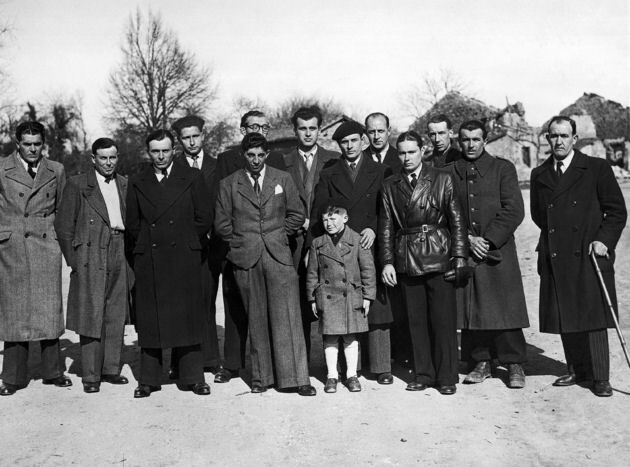 Back row, left to right: Yvon Roby, Jean-Marcel Darthout (part hidden and wearing glasses), Maurice Beaubreuil, Hubert Désourteaux, Aimé Renaud. Note: I have been unable to find who owns the copyright for this picture.